I’m using MusicBrainz Picard 1.3.2 for Linux, and have begun the laborious process of tagging, and embedding cover art into, my music collection (over 3000 files). I noticed that when I restart Picard, albums that I’ve previously tagged and added cover art to now show “0 images” in the album summary line in the “Title” column of the right-hand pane. I’ve verified the cover art is embedded, using mediainfo on the command-line to view the cover art tags, and eyeD3 to extract the image (which I then view), so I don’t know what the problem is here. When I right-click the album and select Refresh, it still shows “0 images”. Apologies if this was already posted. This is my 1st post on this forum, and I searched for this topic, but couldn’t find anything to help myself. I think you’ll find the 0 images means Picard hasn’t found anything new yet. If you got to OPTIONS \ COVER ART what do you have selected in here in the Cover Art Providers list? As I said, I embedded cover art for an album using Picard, and then when I restarted Picard, the right-hand pane shows 0 images for that album, and also the bottom-right cover art preview pane shows no cover art. 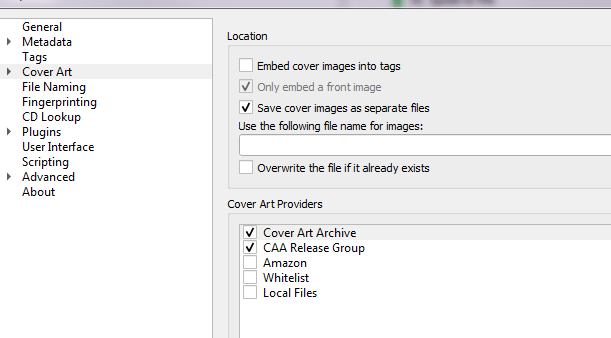 This only occurs for 3 albums, and all the other albums I embedded cover art into show with 1 image in the right-hand pane and with an image in the preview pane, after a restart of Picard. So why does this occur only for 3 albums, and not the others? 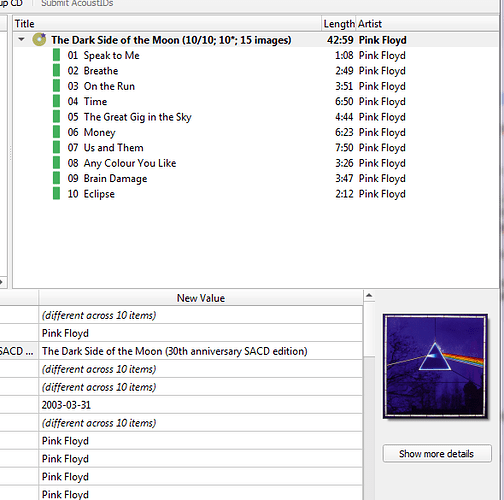 I verified using command-line utilities that these 3 albums’ audio files do have the correct embedded cover art. What file format do the files of those 3 albums have? Maybe something is broken with those files, e.g. maybe they contain more than one tag block. Hi, thanks for the reply. I don’t know what a tag block is, and internet search didn’t tell me anything. Both albums are MP3, and both by the same artist. I bought and downloaded both from the same online vendor. I did a diff of the output of mediainfo for a randomly-chosen file in each album, and couldn’t see any difference that stands out. Do you have any references for what a tag block is? I’m always willing to learn more. This isn’t a major issue, because as I said the files have the artwork embedded into them by Picard, it’s just an odd display quirk of the Picard GUI (as far as I can tell, anyway). So I can ignore the problem. I just like solving them, that’s all.